An graceful bald eagle with wings spread wide, swoops in close to the water to catch a fish near the surface. A Spread Eagle with wide open wings just before catching a fish. You can see the whole wingspan of this spread eagle, parts even reflecting on the water surface. It is an amazing sight watching a bald eagle from a close distance with wide open spread wings, it is actually almost scary. The biggest challenge photographing eagles is to catch the right moment. I photograph bald eagles for a while now and I find more and more that the experience is one of the keys to capture good, powerful eagle photos like this one. 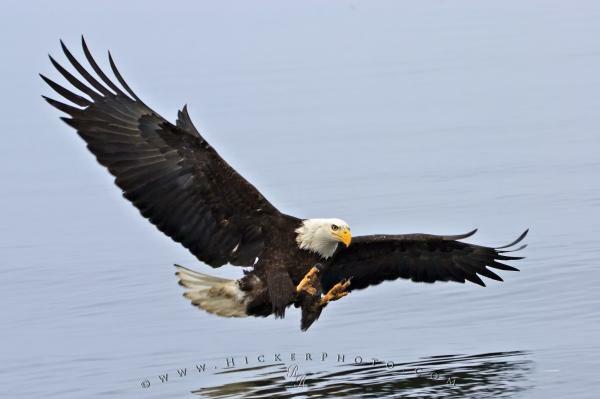 Photo of a bald eagle with outstretched wings just above the surface. Pictures from photo gallery "Eagle Pictures"
This picture is part of the photo album "Eagle Pictures" - there are more beautiful images waiting for you.